This highly neglected and often overlooked set is an excellent challenge for the philatelist who likes to study plate flaws and perforation varieties, while having access to a moderate amount of shade varieties. It is a good set for collectors of limited means to the very wealthy. Those of limited means can focus on mint, which is very affordable, and to a lesser extent used singles, while those with deep pockets can set their sights on the covers and postal history, which is incredibly rare and expensive. The set was issued on January 1, 1872, and saw only very limited use because Prince Edward Island joined confederation on July 1, 1873 and the stamps were withdrawn. Consequently, mint examples of all values are relatively common, but some of the perforation varieties and plate varieties are scarce. This gives the collector of limited means the opportunity to seek out large blocks and part sheets: something that they could not hope to do with most issues of this time period. The stamps were printed using typography, by Charles Whiting in London. 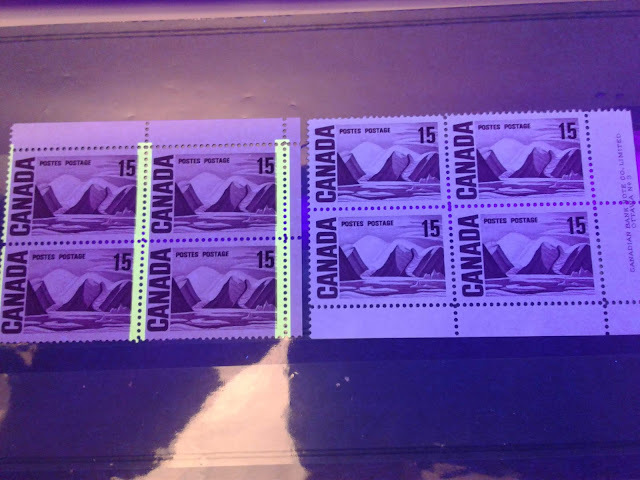 Whiting is not a firm that we see much in Commonwealth philately, and indeed in Canadian philately. In fact, I can't think right now of a single other issue that they printed. The stamps were printed in panes of 100 stamps. They used a master cliche for each value of 10 subjects to produce the pane of 100 stamps. Consequently, there are some plate varieties that occur 10 times in a sheet. Despite this documented fact, there has been very little study that I know of devoted to investigating all of the plate flaws that are to be found on these stamps. Plating each of the values would make for a very time consuming and rewarding study. As you can see, they are not the prettiest stamps in the world, which may be one of the reasons why they have been neglected so much by collectors. However, they can be found in a number of perforations, shades and with a number of interesting plate flaws that have yet to be studied. An interesting field of study would be to investigate the different types of gum used and see if they can be tied back to specific printings. Gibbons only lists these perfs on some values and not others, even though they probably should exist for all of them. The first perf is listed on the 1c and 3c, the second one on all values except the 1c and 3c. The third perf. is listed only on the 1c, 3c and 6c, and the fourth perf is listed only on the 1c and 3c. So a good challenge for the student of this issue would be to focus on the 2c, 4c, 6c ans 12c and see if they can be found in the other perforations. Secondly, it is not known whether the measurements in between the ranges quoted above are of philatelic significance, but perhaps some study can be done to measure the exact perforations and to tabulate whether or not they are all consistently one measurement or another. Of course it is entirely possible that one could discover a perforation measurement entirely outside this range, given that the the very first issue, which was also produced by Charles Whiting was perf. 9, as well as 11, and 11.25. It seems entirely possible to me that the 11 and 11.25 could definitely exist on this issue, as these measurements are found on stamps issued as late as 1869. Perhaps the best range of shades is found on the 1c, which can be found in brown orange, orange and yellow orange. The 4c is listed in yellow-green and deep green. Other than that, the catalogues do not list any other shades. However, I do not believe that this is because none exist. Rather, I think it has to do with the fact that one rarely sees lots and lots of examples of these stamps alongside each other, which would facilitate the study of shades. I think there is a fantastic opportunity to make discoveries of shades, some of which may be very scarce, if one has the patience to seek out and acquire as many mint examples as one can find. On this stamp you can see a huge flaw just below the "P" of "Prince". Is this constant? or just a freak? I have no idea. It would take a detailed study of any surviving sheets to determine the answer. Here you can see some feint doubling of the outer framelines in the lower right corner. The above covers were made by taking a genuine envelop to the UK and adding the stamps along with phony postal markings. Because the covers look aged and some of the markings are genuine, it is very easy to be fooled by them unless you know the genuine markings and rates intimately. Among the most elusive items are the 3c, 2c, 4c and 6c bisects used on cover. Gibbons lists a vertical pair of the 3c, imperforate horizontally and perf. 11.5-12 vertically, and both horizontal and vertical imperforate between pairs of the 6c black perf. 12-12.25. However, it seems quite likely that somewhere there could be such varieties for the other values. In addition to forged covers, one can find a variety of forgeries of the basic stamps, despite the fact that the genuine mint ones are not scarce. The usual suspects for this period such as Spiro produced forgeries as did Taylor and others. They can generally be identified with relative ease, as the details of the design will not quite look right, or the colours will be off. Interestingly, I would wager that the forgeries are quite scarce now in their own right and possibly worth more than the genuine mint stamps in most cases. The proofs of the original cliches as well as design sketches could possibly exist somewhere though. They would be of extreme rarity and value if they do exist. Do you have anything to add in regards to this issue? Please let me know and I will update this post to include additional information as well as scans of any interesting material you may have.